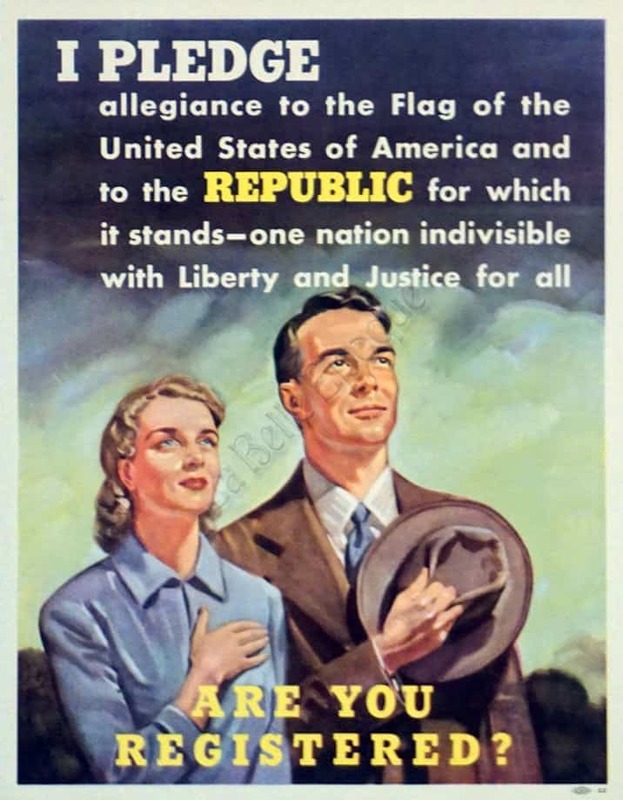 This is a patriotic American advertising poster from World War II created by the United States government. This poster features bold typography that surrounds the central scene of the image: a realistic representation of a man and a woman standing, with their hands over their hearts, looking wistfully into the distance. Above them it reads in white lettering, “I Pledge allegiance to the flag of the United States of America and to the REPUBLIC for which it stands – one nation indivisible with Liberty and Justice for all.” Below it says in capitalized yellow typography, that mimics the capitalized “republic” above, “Are you registered?” This is a beautiful and moving example of the posters that were created by the American government to encourage participation in the ongoing war effort. The original Pledge was created in 1892. It did not include the phrase ‘United States of America.’ In 1923, this was added. In 1942, the Pledge was formally adopted by Congress. Lastly, in 1954, the current version (that includes One Nation under God) was created to combat the scare of Communist regimes across the Atlantic.